We finally got a cold front in this week after having unseasonably (and unwelcome) 80 degree weather here. So, of course, I pulled out the crock pot to make a roast. The one I remembered making previously was so simple and delicious so I thought I’d give it another try. This time I cut the Italian Dressing packet in half to cut down the sodium and also left out the beef broth to cut down on the juices. It really does take a long time of slow cooking to make the meat tender. 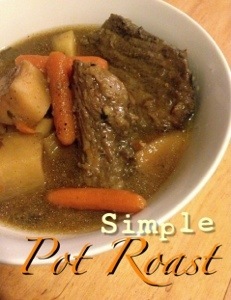 And the thick broth from this pot roast is so good. I could slurp it up all on its own and make a meal out of it. Place carrots and potatoes in the bottom of a large slow cooker. With a fork, prick the steak and season with pepper and garlic salt. In a small bowl, mix seasoning packets together. Place meat on top of the vegetables. Sprinkle seasonings mix over and around the roast. Add water around the roast.